When I feed my dogs, I feel very good about the food they are getting. A couple of years ago I finally took the plunge and read up about feeding dogs, what food is good, and what is not. I also read about feeding a raw diet and after that I was hooked. After a few months of actually grinding my dogs food (anyone want to buy a meat grinder? 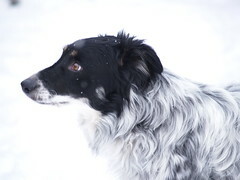 ), and feeding raw bones, I finally figured out what was best for me and my dogs. I like the idea of feeding raw bones, but it scares me. I’m afraid that the bones will get stuck or otherwise harm the dogs. So I no longer feed them bones. 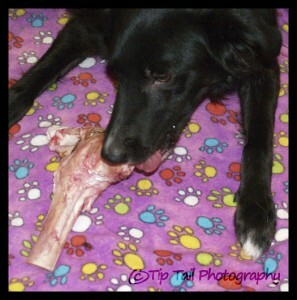 Well, I do feed them bones like Levi has in this picture, occasionally, but no longer do they get raw chicken or chicken necks. They get ground. I found a local game processing place that grinds wild game (with turkey and bones or without) and that is what they get for their raw meal. They also get Honest Kitchen dehydrated along with their raw ground meat, as I feel like it has the necessary supplements that they need. In the mornings the dogs get a kibble meal. Usually they get Blue Buffalo dog food. Lucy, with her megaesophagus, sometimes gets Canidae, because it grinds up a bit better. They were eating Avoderm, but we switched recently to Blue Buffalo. I have been adding some Evo into their food too, mainly for Lucy and Angel, since they are the older two, and I want to increase their protein intake. The dogs also occasionally get Keifer, raw eggs, cottage cheese, and green tripe. When I feed them these things I’m happy they are getting variety, natural foods that are best for them, and I like to see how much they enjoy it. So I’m happy with the food our dogs eat! First off, dogs like to lay their heads on keyboards, and it makes it hard to type! So anyway I want to teach Tatum flyball the right way. And she’s not very high drive when it’s just me and her… so we are working on the small bits. I want her to have a nice swimmer’s turn. There is a good article on training the box, which starts with very basic steps, over on Flyballdog Tag. And we need basics. Microshaping, even. I got out the clicker and treats and I put down a white lid. Tatum knows to touch it with her nose, to run over to it and get treats, but not how to put her feet on it. So first step, get the feet on it. Well, she wasn’t moving her feet at all, so I put the white lid away and started to teach her to just move her feet. She laid down, which was fine, and to get her to move her feet I put a treat in my hand and moved my hand far too her right. When she turned her body (lying down) to get closer to the treat, I clicked and gave her the treat. I kept moving my hand around to encourage her feet to move during the first training session. We did this for a few minutes and then stopped. A few hours later we tried again. I’ve been wondering how clicker savvy she is, as she’s very calm and subtle in her movements sometimes. We did the same thing.. I’d move my hand, she’d move her foot (either one, didn’t matter) and click treat. Then I stopped moving my hand to see if she was getting it. First couple of times she just stared at my hand for a good minute, I swear. So I moved my hand again. But she was thinking about it. So I laid my hand still again, with treats in it, and she moved her foot! Click Treat! After a couple of those, she started putting her foot on my hand! Yay! She is officially clicker savvy! I’m excited. She doesn’t offer much behavior to me.. not like Levi does, who throws himself all over the place to see what I want. But she’s a girl, she’s more posed than my goofy boys. And she’s still a bit shy when we work alone together. But to see her think and figure things out is great. I’m excited. I need to just learn to understand how she learns, and how she offers behavior, and how to shape her so we find out what we want. And then put the behavior on cue, Only on cue, and Always on cue! Then I’ll be happy with my own training! Oh.. so the next step is to get her to put both feet on the target, then put the target on the flyball box, and then get her up with all four feet. But that’s a while away so far. It’s gonna be great to have a flyball collie! I just watched the AKC Invitationals… I would love to see Tatum there. Would love too! Sometimes I have too many toys hooked up to the HDTV and I need HDMI splitters too watch all I want. I want an HD DVD or a Blueray DVD… someday! Now I have to also consider the consequences of doing this. At first, I was letting her nibble on my hand to get the treats. But she has such a soft mouth now I don’t want to reward her for being bitey when taking treats so I stopped that. In addition I need to consider the white target. I use it for other things too, and usually it’s just a target to do a nose touch with and to get treats from. If I teach her to put two paws on it, she has the potential to do that all the time in all training environments. So maybe I need to use something else.. when we reach that point. Maybe I need to make a special flyball target so I can still use the white lid for obedience targets and agility targets. Hrm… something to think about. This is Muffit. Okay, his name started out as Wheatie, and then he came to live with us for a while as a foster boy. And for some reason, I just wanted to call him Muffit! Remember Muffit, the mechanical dog from the original Battlestar Galactica? Well, yup, that’s what I like to call him. But then he went to his new home and they named him Shiloh. We fostered him for CAWS, and they are a great rescue organization. They did follow up calls, made sure all was well. I even saw Shiloh at an agility demo about a year and a half ago.. and he was running around and looked happy and I was glad to see him. It was pure luck. Well, while I was in Los Angeles at the Clicker Expo, my husband got a call from CAWS. Poor Muffit had been dumped at the Humane Society of Utah. Not only that, the HSU didn’t scan him for a chip for two weeks! So now he is sitting next to me on the couch and he has a nasty cold. His breathing is labored. He’s super skinny, and when he came back to us his poop was complete liquid and crimson with blood. The vet thinks it was stress induced colitis. He’s on antibiotics. He is not eating too well yet, I’ve tried raw, kibble, canned, cottage cheese.. and he just kinda picks at his food. He’s getting some down, though. Poor guy. He’s only 26 pounds and needs to gain at least 5 to be healthy. My husband really wants to keep him. It makes us furious, and breaks our hearts, that this poor boy ended up at the shelter. The excuse was the family had to move and couldn’t take him with. The contract says, and the adopters say over and over, you return to him to the rescue! Not dumping him in the shelter! We are furious. Well, he is safe and happy now. He might just stay here for a while.. or forever… he would make a great flyball dog. 🙂 I wish we could give him something for his cold symptoms. It’s Christmas Collie Day! Or, err… Christmas Day for the Collies. 🙂 One or the other, or maybe both, even. And my sister (human sister lol) and her son got the dogs some fun toys. One is a Christmas tree. The other is a rabbit that lost his head. And everyone knows that pulling the stuffing out of stuffed animals is the bees knees and really needs to be done. What is all that stuffing doing in there anyway? And then they took the toys outside, and did some playing out there in the snow. I stood out with them and encouraged the play, which was fun. But it was only 15 degrees out there and I got cold pretty fast. The cold doesn’t bother the dogs, though. Nope. In fact, they really like the cold. It gives them extra energy particles somehow and they have to zoom around the back yard in order to burn them off. Silly zoomies. I like the picture of Angel, Chase and Tatum all tugging on the tree. Tatum is not a big tugger… yet. As soon as she realizes how fun it is, and that it’s okay to do, though, she’ll catch on. She likes tugging better with the other dogs than me. Levi wanted to guard the pink bunny more than play. He loves to guard. He will gather up all the toys, or bones, in a pile and growl over them. I have to take them away, or pass them out to everyone so everyone has something. He is a silly collie boy. They are all silly collies, actually. Right now they are chewing on rawhide bones, and having a good time doing so. I ordered bully sticks for them too, so they will have those as well. They do love to chew. It is a fun day. Hopefully we won’t need a colon cleanse after all the goodies we are eating, though!